This tutorial shows you how to create Spring Security Basic Authentication Example using Annotation. With this example you are easy to secure your application using Basic Authentication. You are similar to the REST API via the tutorial Spring MVC RESTFul Web Service CRUD Example. Now i make sure that you are concerned about the security issue of this application. How can we secure this application? Of course we can do that by using Basic Authentication or OAuth2 security solution. This example will inherit from source code of the tutorial Spring MVC RESTFul Web Service CRUD Example. Here, we have to enable the Basic Authentication in Spring Security via two steps. 1. Configures HTTP Basic authentication. 2. Configure authentication entry point: this entry point will be triggered if the authentication fails and it will response to client error message. Actually, we create the MyBasicAuthenticationEntryPoint class which is extended from BasicAuthenticationEntryPoint for customizing the response message. Here, we reuse source code of the tutorial Spring MVC RESTFul Web Service CRUD Example to build Spring REST API. So we don’t introduce about how to create Rest Controller here. Notices that we have to put two above classes and spring security dependencies into the current source code. You can refer to the completely project by downloading attachment. 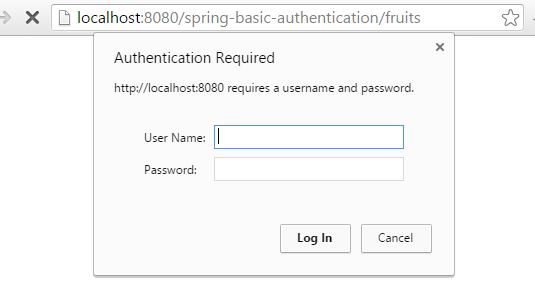 That’s all on tutorial how to create Spring Security Basic Authentication Example. If you have any opinion please leave comment. Do you have the xml configuration ?